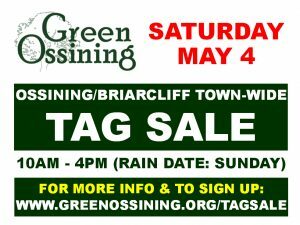 Thank you for registering as a participant in the Ossining and Briarcliff Manor Community Tag Sale! SINGLE HOMES: For $25, one snazzy double-sided tag sale sign to put on your property from the Sunday prior to the sale (check with HOA/landlord, if applicable, for restrictions prior to registering), as well as three optional paper signs to hang around your neighborhood. You will receive $10 upon sign return. If you are a condo/apartment property with multiple sellers at one location, you must sign up for the MULTI-HOME/BLOCK SALE as per below. MULTI-HOME/BLOCK SALES: For $50, two snazzy double-sided tag sale signs to put on your property from the Sunday prior to the sale (check with HOA/landlord, if applicable, for restrictions prior to registering), as well as six optional paper signs to hang around your neighborhood. Additional signs for additional properties are $10 each. You will receive $10 back for each sign returned. The person who is coordinating the sale for the multi-homes or block is responsible for returning all signs. CHURCHES/NON-PROFITS: For $25, one snazzy double-sided tag sale sign to put on your property from the Sunday prior to the sale (check with HOA/landlord, if applicable, for restrictions prior to registering), as well as three optional paper signs to hang around your neighborhood. You will receive $15 upon sign return. Signs will be available for pickup at the Green Ossining Earth Day Festival on Saturday, April 27. Further sign instructions will be emailed to you from amanda@buzzmaestro.com (please add to your address book so this email does not go to you spam filter). A LINK to your address and what goods you’re selling on our Google Map to be distributed electronically to anyone interested in the tag sale; your personal information (name, phone number) will NOT be included. The map will go live on Wednesday, May 1. ADVERTISING with notices about our Town-Wide Tag Sale in the Pennysaver, local press, bulletins, and assorted social media outlets. A SPOTLIGHT ON YOUR SALE in a special Ossining/Briarcliff Town-Wide Tag Sale Facebook Group (especially if you have a big-ticket item you’d like to highlight). We can also “share” any Facebook posts or links you make to your sale. 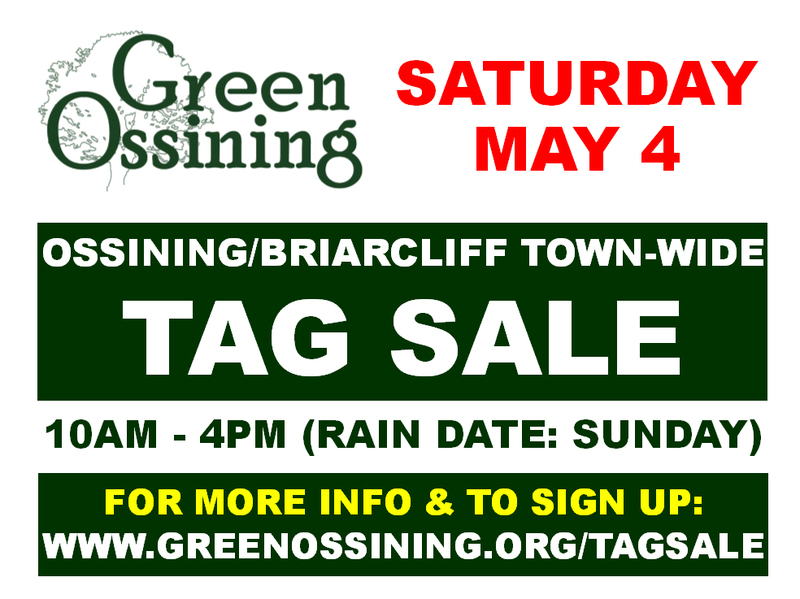 REFUND INFORMATION: If you return your sign (which must be removed at the end of the sale) to Green Ossining by Saturday, May 18, you will receive a $10 refund ($15 for churches/non-profits). More information will be emailed to you after the sale as to when and where you can return the signs. A full refund, minus a $3 administration fee, will only be given if you cancel your participation in the tag sale by Monday, April 29 and the sign is returned. After April 29, you can only receive a $10 refund ($15 for churches/non-profits) for a sign return by May 18. Please note, we also cannot give a full refund if you choose not to hold your tag sale due to weather. Thank you for participating!